All this time I’ve been known for my love for Momokos and have re-rooted so many of these girls. So I feel a little guilty each time I sell another to fund yet another resin purchase but there’s no turning back. 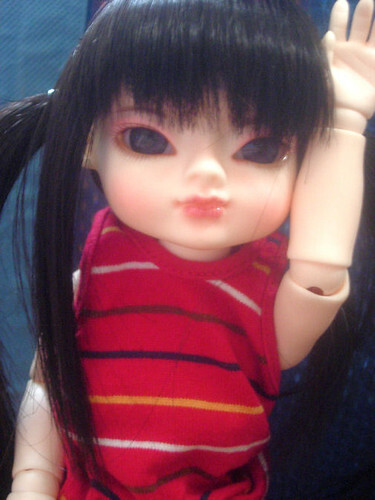 I’m truly hooked on Asian ball-jointed dolls and the choices are many. I’ve let go of quite a few momokos and am down to 13. Meanwhile my resin kids are multiplying. I think I’m up to 12 but half of those are Lati yellows and those are small,(actually shorter than a momoko,) This latest girl is Domadoll Okja. Her story is so cute and irresistible that I had to have her. She stand just a little taller than a Momoko but completely different proportions. I just love her sass and her rubenesque body. Now here’s an experiment I had fun with. I had a Bobobie Erin that I got for the body but then didn’t need her body so I took her apart and put her in rit dye and now she’s this little green girl. Not perfect but pretty cute I think.